With summer approaching it’s about that time to start thinking about the bottles that will accompany your light fare and barbeques to get you through those hot summer days. Always a hard time of year for me, switching gears with my wine purchases and trying to wrap my brain around the myriad of white wines I taste throughout the year. Well, this year I already have part of that task under wraps, after tasting through a line up of wines from a new winery, Massican. 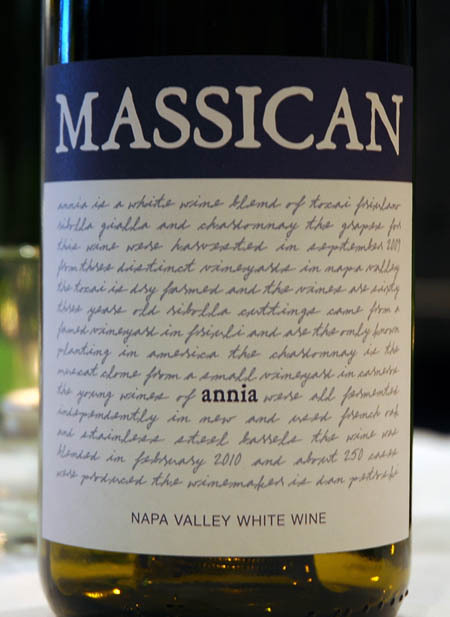 Owned and operated by winemaker, Dan Petrosky, Massican is a very limited production boutique operation from Napa Valley. Dan, who honed his skills in Italy at Valle Del’Acate and then as the assistant winemaker for Larkmead vineyards, is truly a man driven by passion. Listening to him speak about these wines is like hearing a love song that speaks to your heart. 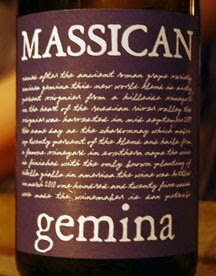 Massican, Annia 2009 – A blend of tocai friulano 44%, ribolla gialla 29% and chardonnay 27%. A very light white gold color in the glass showing aromas of lime, white flowers and almond. This wine smells like a fresh spring breeze. On the palate you find grapefruit, stone and almond skins with a zing of acidity that really makes your mouth water. Massican, Gemina 2009 – A blend of viognier 60%, chardonnay 20% and ribolla gialla 20%. This wine showed a bouquet of peach nectar, honey suckle and a hint of clove on the nose. I was expecting a heavier mouth feel due to the healthy dose of viognier but what I found instead was extremely fresh and palate teasing with flavors of sour apple, citrus rind and a beautifully fresh finish that kept me coming back to the glass for more. 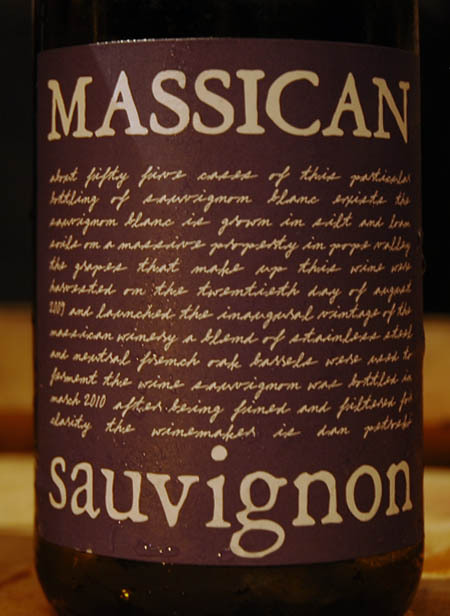 Massican, Sauvignon 2009 – 100% sauvignon blanc. Showed a floral nose with granny smith apple, almonds and a slash of wet rock. The palate showed strict, mouth-watering acidity with lime, layers of earthy minerals and a sweet mid-palate. All of this led to a nice sour apple finish. Believe it or not, what really started me on the path to fine dining was catering High Tea. I know that most people suddenly visualize a group of stuffy affluents with their pinkies sticking out while sipping from fancy china. In some cases you'd be right, in some, completely wrong, but what I took from these parties was the idea of creating a menu designed around a number of small delicacies, much like a tasting menu. More to the point, I discovered the world of the canapé. 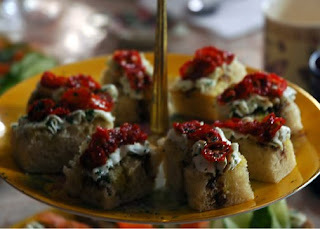 A canapé is finger food, which is usually decorative, just one or two bites, yet delivers large amounts of flavor. Create a tray of just three canapés, which are each very different in flavor, aroma and color. One might be incredibly rich, one heavily seasoned, the other simple yet blissfully refreshing. You just provided your guests with a menagerie of flavors and sensations that can't be matched by a single entree. Some of these items translate perfectly into the cocktail party or wine tasting atmosphere. Imagine pairing three wines with three completely different canapés and then guiding your guest through the tasting as they realize how each canapé helps or hurts the wine and vice versa. Today we’ll focus on just one canapé that is extremely versatile and happens to be a favorite among my friends and clients. Serve it as an appetizer or as hors d'oeuvre. I’ve also included a great Italian white that will pair perfectly and won’t break the bank. This canapé is a meld of intense flavors that work perfect in unison. The focacia will add a bit of salt and olive from the oil. The goat cheese mousse will lend the sharp flavors of the chive and sweet vegetal notes of tarragon, while soothing the palate. The tomatoes are intensified by the roasting and work to cut through the creaminess of the goat cheese. Finally there’s balsamic reduction, which adds sweet woody and spicy flavors. You can expect to hear the hum of ‘oh’ and ‘yum’ around the table. Set your oven at 200 degrees. Slice the tomatoes cross-wise and discard the ends. You should have about 4 slices per tomato. Place in a bowl and added enough olive oil to coat the tomatoes. Then season them with salt and pepper. Lay the tomato slices out on a parchment lined sheet pan and place in the oven. Roast them for about 1 ½ to 2 hours. Place goat cheese and heavy cream into a food processor. Process this mixture until creamy and then add the tarragon and chives. Pulse these until they just come together. Move the mixture to a bowl and season with salt and pepper to taste. Place this mixture into a piping bag. (An easy tip at home is to use a zip lock bag. If you have piping tips, you can slice a small edge off the bottom corner of the zip lock bag and insert the piping tip into the edge. Hence, creating a piping bag.) Refrigerate this mixture until 20 minutes before assembling the canapé. When your tomatoes are done, pull them from the oven and set them aside. Place the balsamic vinegar into a small pot over low flame. The idea is to reduce the vinegar by half into a syrupy liquid. Set the reduced balsamic vinegar on the side to cool. Next, drizzle olive oil over the focaccia bread and toast until slightly crisp. To assemble, pipe the goat cheese mixture onto the focaccia. (I find that a star tip makes for a great presentation. Then add 3 – 4 slices of roasted tomato, fanned out, over the goat cheese. Drizzle the balsamic reduction over the tomatoes (a little goes a long way). Garnish with a sprinkle of minced tarragon. This wine is like a fresh gust of wind on the Adriatic coast, or so I imagine, as aromas of olive, hazelnut, wet rocks and a bit of butter rise from the glass. The palate shows zippy acidity with pear, melon and a bit of green grass. The mid-palate is sweet, which mixes well with this bottle’s lively acidity, giving it a medium weight. Sour apple and almond skins are on the finish. In my opinion, this drinks like a white that could cost twice the price. 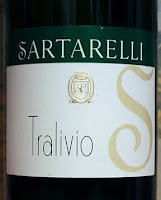 Find the 2007 Sartarelli Verdicchio, Tralivio on wine-searcher! 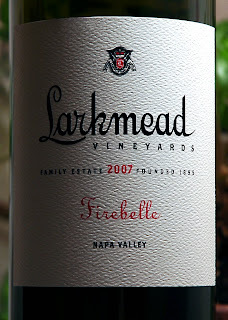 While in Napa, there was only one mailing list that I signed up for without hesitation: Larkmead Vineyards. Nowhere else, was I so impressed across the board with each of the wines put in front of me. For the last six months I have eagerly awaited the arrival of my winter allocation and now the wait is over. The 2007 Firebelle is a blend, made from 62% Merlot, 29% Cabernet and 9% Malbec. On my visit, in July of 2009, I had tasted the 2006 and was amazed by the balance of intensity and acidity, which resulted in a rich yet fresh and satisfying wine. It had all the stuffing of a California merlot blend, but with elegance and nuance that swept me off my feet. Before leaving I was treated to a sample of the 2007, from tank, and it was mind-blowing. All the qualities of the 2006 were present but with a vibrancy that seems to be a calling card of the 2007 vintage. Now tasting this from bottle, over the course of three hours, I was in store for another treat. The aromatics of this wine are spellbinding. The intensity of fruit is up front and captivating but, as you continue to swirl and sniff, you find more and more within the glass that you hadn’t noticed before. It’s rare that I find myself limiting the amount of descriptions in a wine note but, with the 2007, that’s exactly what I had to do. I don’t recall ever saying this about a California Merlot blend, but this bottle is worth the price of admission on the aromatics alone. To top this all off, the palate is balanced and refreshing. This is a wine that works with food but can also be sipped on its own without ever being tiring. The 2007 Firebelle is a hidden gem in Napa Valley and it's price, which is more than an everyday drinker, is a bargin in comparison to what's out there. A wolf in sheeps clothing, so to speak. My Notes: Deep purple color at its core, which fades to dark ruby red at the edges. The aromatics are intense and rich but, at the same time, fresh with aromas of dusty red fruit, wild berries and a floral nose that swings through violets, mint and lavender. All of this with a hint butterscotch that lingers with each sniff. On the palate you find a mouth coating yet utterly electric collection of flavors. Blueberries and black currants with herbs and earth are all supported by a perfect balance of tannin and acidity. The long, long finish shows mocha and dark fruits. Well done.